The mental game is probably the biggest difference between PGA Tour players and amateurs. Better players have more control over their mental and emotional state – it’s that simple. But they practice this just as hard as every other area of their games. I’m going uncover how that practice works and show you how to develop the Tour Player Mind-set. “I just want to say thank you. I can honestly say that your book has changed the way I see golf(for the better) and the way I see myself. The drills are incredible and keep you from experiencing the false confidence that range practice can give. This book is amazing because it isn’t fluff, It doesn’t just tickle your ears and tell you how to hit it 450 yards or promote the newest gadget, it gives you a mirror and lets you take a brutally honest look at yourself. It gets to the heart of being a better player and helps you understand and enjoy what golf really means to you. A great way to work on your feel is to take the visual element away and putt with your eyes closed. This exercise isn’t really about how many putts you hole, it’s about becoming aware of the feeling associated with the length and direction of each putt. Once you have the line in your mind’s eye and you are correctly aligned, it is all about feel and making a good positive stroke. This drill will help you achieve this. a. Take 3 balls and a drop them down approximately 10 ft from a hole. I say “drop them” so you don’t have exactly the same putt each time. b. Go through your putting routine of reading the putt, visualizing the line (and seeing the ball go in), feeling the stroke and addressing the ball. c. When you are about to start your back-swing, close your eyes. Then putt. d. As soon as the ball leaves the putter (and still with your eyes closed), make a call as you where it finished. E.g. short-right, long-left or holed it! e. When you open your eyes and see where the ball has come to rest, grade yourself on how close you were to the putt you felt. Play 9 holes and try to beat 18. If you hole one and called it give yourself 3 points. Another thing this does is force you to work on a consistent set up. Because you can’t see the ball, your putting will be inconsistent if your ball position is inconsistent. Aim of the game: become a better ball striker. Ball striking is a huge factor in good putting. If you can’t consistently hit the ball in the center of the putter, you won’t putt consistently. This drills makes a center-putter strike the focus. a. After you’ve read the line and gone through your routine, settle over the ball. b. The aim here is to keep your eyes on the back of the ball, which is the contact point for the putter, for a brief period before starting the putting action long enough to say “back of the hole”. You could also count 1-2-3 and then putt on “4?. c. Immediately after each putt (before you see where the ball went), grade yourself out of 5 on the quality of the strike, so this starts to become the goal. You’ll start to see that the better the quality of your strike (out the sweet-spot) the better the result of the putt. Watch the world’s best players and you’ll notice them switching rapidly between looks at the ball and the target, then fixating on the ball for 2-3 seconds, then remaining in the same position for 1-2 seconds after it. So many of the amateurs I work with are so focused on swing mechanics, they lose sight of their objective – to hit the ball to a specific target with a clearly visualized shot shape. I’m going to teach you how to see and feel shots, not think about the action you need to do it. The more practice visualization, the better we become. OK, so Tour pros play under tournament pressure every weekend so they just get used to handling it? Right? Wrong. Tour pros know techniques to remove themselves from the pressure situations, so they can relax and stay focused on the shot at hand. Using breathing techniques and being able to distract your mind in between shots, you’ll learn how to stay calm. In golf, you can’t try to shoot your best score, it just doesn’t work that way. The key is to think about a good round as a collection of individual shots, executed as best you can and learning how to be patient. PGA Tour players have an average bounce-back rate of 25%. This means that after every hole that they score a bogey or worse, they score a birdie or better on the next hole, 25% of the time. It’s like it makes they more determined to play better. The amateur, on the other hand, is most likely to follow up a bogey or worse with another bogey. I’ll show you techniques to accept the outcome of EVERY shot, and quickly move onto the next without losing confidence. Do you realize how important breathing is in a good golf game? We’ll it’s very important. Breathing can do so many things to help you focus, get rid of negative energy and stay calm. Golfers seems to be very critical, and this only gets in our way. Find out how to takes positives from every golfing experience to raise your enjoyment and lower your scores. One of the biggest mistakes you can make is to start analyzing and trying to correct your swing faults on the golf course. You just have to trust what you have and commit to every shot. Unless you’re playing for your living, golf is a way to relax and enjoy your free time. But how many of us really relax when we’re out there? We equate our enjoyment with how well we’re playing, which is counter productive. The more relaxed you are, the better you’ll play. It just requires a shift of your mind-frame. The top players miss an average of 1 in every 3 greens and spend 40% of their shots within 50 yards, a.k.a “The Scoring Zone”. But the fact is they get up and down almost all of the time. They do this through practice, learning how to play the right shots and playing with visualization and feel. Do you have a winning routine for putting? It’s amazing what you can do when you know how to read greens and approach every putt as if you’re going to hole it. Putting accounts for about 30% of our scores, so if you really want to get better you should learn this immediately. It’s amazing how many shots amateurs lose because of poor shot selection and not planning for misses. As Ben Hogan once said “He who misses best, wins”. Even the Tour pros miss their target – they only hit 2/3 fairways and greens. The difference is they allow for these misses as part of their course strategy. How many shots would you save if only you’d thought about what the next shot was going to be like if you missed your target? I’ll show you how include a course strategy a tour caddy would be proud of. Warming up is not just about loosening tight muscles, it’s about getting your mind in the optimal state to make it a successful 4-5 hours. I’ll show you how to warm up your visualization and feel, start synchronizing your body and mind and keep your mind-set as positive as possible. As with everything you want to do as best you can, if you’re not 100% in the present, you’re under-performing. Coming down the stretch and thinking about winning or beating your best score before you’ve holed that final putt on 18, will hurt your score. I’ll show you how to stay in the present, solely focused on the shot at hand. To make your practice as effective as possible and to reduce the number of mental mistakes during our next round, we need to be honest with ourselves at the end of every round. I’ll show you what to look out for and how to put it right. In addition, you’ll get a FREE audiobook, so you can listen to it on the way to practice and play. Unfortunately this is true. I happen to believe that time is the most precious thing we have, so why most golfers would continue to waste it practicing in the wrong way, I have no idea. What most of us fail to realize, is the Mental or Mind Game, needs to be practiced like every other area of your game and with the right drills you can make progress with every session and round. 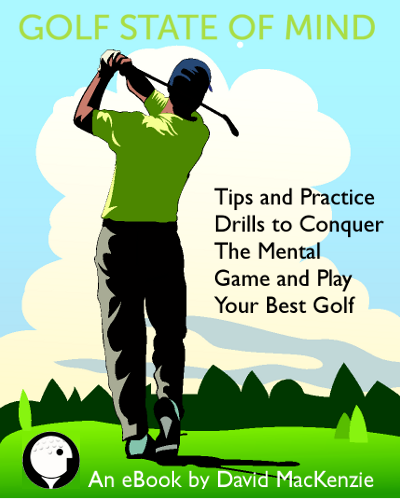 The Golf State of Mind e-book is the culmination of thousands of hours spent working with players of all levels and interviews with PGA Tour players to find the very best practice drills so every minute you spend on the driving range, short game area and practice green is spent as effectively as possible. Hitting balls on the driving range over and over again, tinkering with your swing is counter productive. We need give each practice session a purpose and make it as meaningful as possible. Undoubtedly the best way to practice is with the same pressure you would feel on the golf course, not focusing on mechanics and hitting to the same target over and over again. We need to practice under the same conditions that we play and we’ll have more fun while we do it. This eBook contains plenty of games that will make you feel nerves and get better at handling them. You’ll play against yourself (like you do on the course) and your heart will race over the last few shots to beat your best score, just as it would when coming down the stretch of a big tournament. By practicing drills you would not expect, you’ll learn how to ingrain a “feeling” for shots. Did you hear about Seve Ballesteros and his 3-iron? Seve learned to play golf with only a 3-iron. He could do everything with it – play from all distances, chip and putt. It didn’t matter that the club had the loft of a 3-iron, Seve was able to see and feel shots and pull them off. Try hitting the same club to targets of different distances. For example, take your 5-iron and try to hit it first to the 200, then 175, 150, 125 and finishing on the 100. We would never do this on the course, but it’s a good drill for improving feel. To get as good as you can be involves developing feel for your shots – that is, being able to shave off or add yards to the same club to get the ball as close as possible to your target. You’ll learn how to get your mind and body synchronized with non-technical thoughts by playing a relaxed game based around visualization and feel. This eBook has all the exercises to make this happen. I’ve been playing and coaching for almost 20 years and have made it my job to help golfers remove negative mental interferences and find their true potential. The Golf State of Mind website has been running for over 4 years now, and during that time it’s become the #1 resource for mental game coaching on the web. It’s got thousands of members and followers and continues to help golfers develop a simpler, more effective way to practice and play to lower scores and increase enjoyment. I created this eBook as a result of all the lessons, questions, feedback and interviews I’ve done over the 20 years. So, you can be 100% guaranteed that that I know what you struggle with, and all the drills and tips contained WILL help you take your game to the next level. There’s no psycho-babble or fluff, just honest tips and drills. The last twenty years have been the most innovative in the history of golf. Drivers are much bigger, balls fly farther and are more controllable, and clubs are more forgiving. We now have more analysis of our golf swings and ball flight than ever before. Yet the average handicap remains at 16. So why have we not improved? Because we make the same mistakes over and over again. We need a new way to practice and play that eliminates those things that prevent us from getting better. The golf industry wants us to believe that our swings and equipment hold us back, because it makes a lot of money that way. My teaching cuts through that and gives you the belief you need to start playing with a renewed, simplistic perspective of visualization, feel and positive focus. Imagine you are addressing the ball on the edge of the fairway, 30 yards from the green. On the practice green, these are a cinch – but this isn’t the practice green. You need to hole out in two to save the match. Your last shot onto the green was a disaster. You really don’t want to think about the bunker to your left… so of course it’s all you think about. You get the picture. Now imagine addressing that ball with laser-like attention, freed from nerves, niggles and anxieties. Imagine playing on the course the way you do on the driving range. Imagine playing each shot with total confidence. It’s not a fantasy. It’s the Golf State of Mind. Using our drills and techniques you will train yourself to prepare for and play each shot on its own terms. The shots you’ve played previously, or your score, or your opponent, will cease to matter. Because once you start to concentrate on the process rather than the result – to focus only on the shot itself – your game as a whole will start to fall into place. For the price of a couple of drinks at the clubhouse bar you can gift yourself the most effective set of tools for improving every aspect of your game – and that is guaranteed. If you are not 100% happy, we’ll refund your money with no questions asked. By learning the right habits and routines you will take control of your thoughts, manage your emotions and take full advantage of your natural skills to play better golf. Once you’ve developed a Golf State of Mind, you’ll unlock your true golf potential, lower your scores and have more fun on the golf course. “David MacKenzie has created an amazing tool for anyone ready to tackle the mental game of golf. His “Golf State of Mind” system is very organized and yet exquisitely simple. David takes you through each aspect of the game, from long to short, talking you through the stumbling blocks and helping you clear them out of your way. I love it. His insights help my golf game, and my everyday life.” ~ Danielle Tucker, The Golf Club Radio Show. - Craig Morrison, 1 handicap, Edzell Scotland. About David MacKenzie: David MacKenzie is a mental game golf coach and lives in Washington DC. He currently coaches golfers of all levels on how to improve and maintain confidence on the golf course and enjoy the game, irrespective of score. David has devised a unique, yet simple, way to learn golf that does not involve any technical game learning. He teaches drills to improve powers of visualization and feel, how to switch on and off on the golf course and maximize a player’s potential.